Lame Adventure 245: What’s Up with Conan? Me: Is it a pigeon, is it a chopper (about to head downtown to hover over Operation Wall Street), is it an orange blimp? It was indeed an orange blimp floating over Central Park. Since my eyes must be following the lead of my increasingly deaf ears, I first thought that printed on the side of the blimp was Conair, the hair dryer company, and assumed that they had revised their logo. I also happened to have Conair hair dryers on my mind because I use mine to defrost my frost-filled freezer. Even though I had recently left my freezer unplugged for fourteen hours, it was stubborn and remained as frozen as an igloo. Milton told me to boil a pot of water and sit it inside my refrigerator, but instead I sat in front of my freezer while aiming my hand-held Conair hair dryer at the block. Eventually, after what seemed like a week of firing hot air on an avalanche, it melted. I don’t expect this novel approach to defrosting a freezer to catch on, but it might win me a Darwin Award should I eventually electrocute myself. Back to the blimp, whenever I see an interesting site I whip out my camera and photograph it. This air ship qualified as a site worth shooting. When I zoomed in I realized that it was The Conan Blimp. Conan O’Brien is taping his talk show this week in The Big Apple. There is a web site dedicated to Conan’s blimp since basically there seems to be a web site dedicated to practically everything short of my socks, but I have been known to write about those here. I was not aware of this blimp or its web site until I Google searched “conan blimp” and got 293,000 results in 0.16 seconds. Conan has one very popular blimp up there, but trying to photograph it with my camera’s zoom with my hands in sudden delirium tremor mode proved challenging. When I zoomed my lens in on this deceptively (to the naked eye) snail slow moving dirigible, it seems to accelerate full throttle as if it’s a speeding bullet, or better yet, fame-whore Kim Kardashian fleeing her 72-minute (or however long it lasted marriage) to that tall chump. Yet, I did finally get an okay shot and I was almost compelled to drink to that, but instead, I just kept walking. 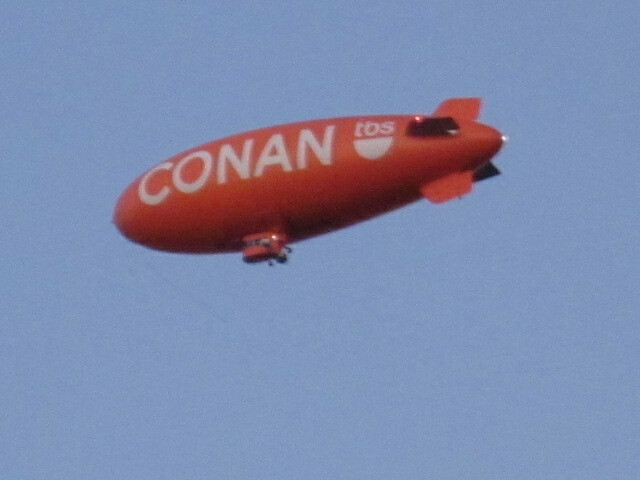 The Conan Blimp at full throttle. This entry was posted in Humor and tagged conair, conan o'brien, defrosting, fame whore, freezer, kim kardashian, the conan blimp, the darwin awards. Bookmark the permalink. No, no–there is a website about your socks–and soon to be a blimp–believe it or not. Weird world we live in. Thank you blowing my cover about those embarrassing sites, Kathy! Ooooh man, I came SO close to making it into a Lame Adventure! I’ve never confused Conan with Conair. But I can see how he would be a good “before” picture for them. Be careful of what you wish for, Lame Adventure-wise, Natassia. Is it just me or did Kim Kardashian’s wedding seem to have lasted longer than the marriage? Here’s a tidbit from a sports website: “With their 72-day wedding allegedly costing $10 million, Kim Kardashian and Kris Humphries have clearly learned that money doesn’t buy happiness. However, with rumors swirling that they are expected to make a profit of $18 million, this was undoubtedly the most lavish day of this quiet Minnesota boy’s life. The illustrious wedding may have caused Humphries to quiver and empty his piggy bank at first, but he is now swimming in cash. Thanks for sharing this gem about the tall and the trashy TTBT! Conan .. Oh how I love him. What a great blimp. I used to have an orange Conair hairdryer. The thing lasted longer than I could ever imagine. The frugal part of me had to use it until it no longer worked, but the frilly part of me wished it would just have concked out already so I could buy something that let me dry my mop in style before one of kids started yelling or writing on the walls with crayola pieces I failed to find and toss. I endured a lot of murals in my time. My off-white-tan-ivory-colored Conair hair dryer (with blue logo) is such a fossil it was made years before some corporate genius said, “Hey! Let’s make these in colors — like orange!” Since I primarily use it only to defrost my freezer I expect it to outlast me. Thanks for visiting and sharing! I think fake rhinestones with the adhesive backs, are in order. Or at least an honorable mention in the hair dryers linen closet of fame. My friend, Coco, has a rhinestone studded jar of Vaseline, so it’s possible that a rhinestone studded blow dryer is out there somewhere.